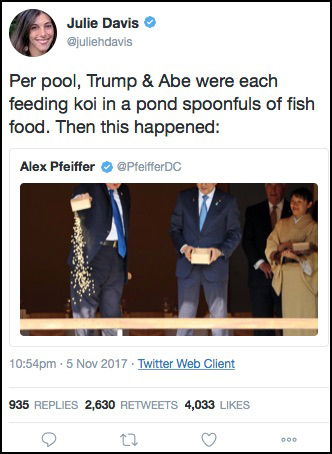 …CNN circulated a deceptively edited video on Sunday that appeared to show President Trump, who was feeding koi fish with his Japanese counterpart Shinzo Abe, simply dumping his box of fish food into the pond. 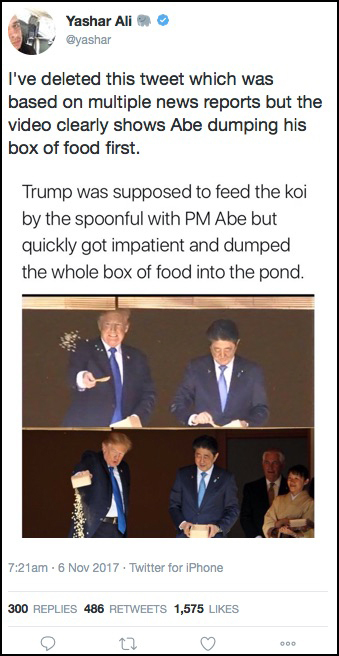 The apparent breach of fish-feeding protocol immediately went viral, as Trump was seen as too impatient to thoughtfully spoon the fish food into the pond, as Abe was doing. The only problem is that … it’s all untrue. 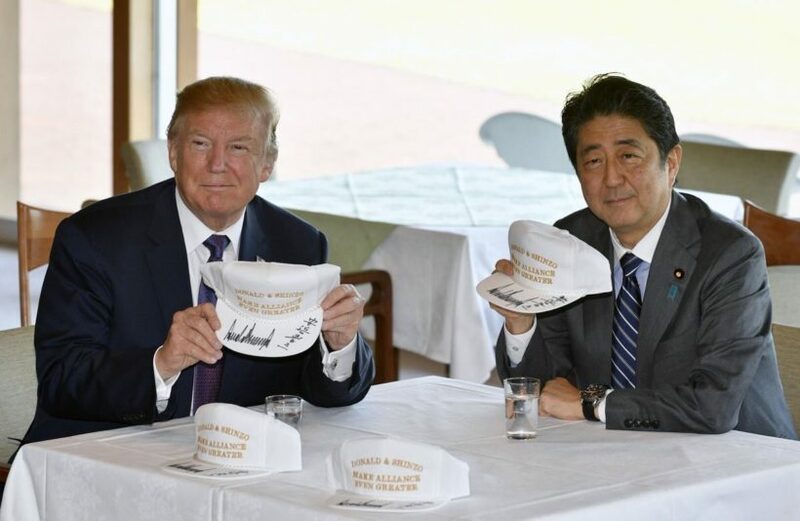 The other fake scandal concerns Trump apparently suggesting to Abe that Japan should build cars in the United States and create American jobs, rather than import them from Japan. 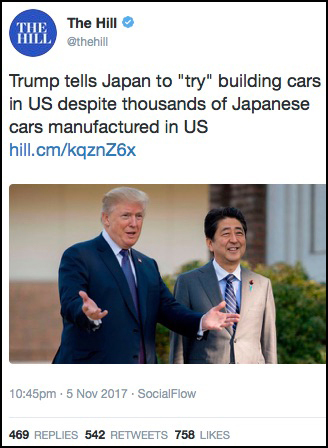 Haha, journalists sniffed, everyone knows Japan already manufactures cars in America! Again, the only problem with this story is that it’s untrue. As the full quote makes clear, Trump not only is aware Japan manufactures cars in America, but he specifically thanks them for all of the jobs they’re creating. “I also want to recognize the business leaders in the room whose confidence in the United States — they’ve been creating jobs — you have such confidence in the United States, and you’ve been creating jobs for our country for a long, long time. Several Japanese automobile industry firms have been really doing a job,” Trump says. 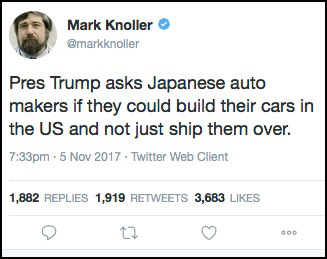 And we love it when you build cars — if you’re a Japanese firm, we love it — try building your cars in the United States instead of shipping them over. Is that possible to ask? That’s not rude. Is that rude? I don’t think so. (Laughter.) If you could build them. But I must say, Toyota and Mazda — where are you? Are you here, anybody? Toyota? Mazda? I thought so. Oh, I thought that was you. That’s big stuff. Congratulations. Come on, let me shake your hand. (Applause.) They’re going to invest $1.6 billion in building a new manufacturing plant, which will create as many as 4,000 new jobs in the United States. 1. 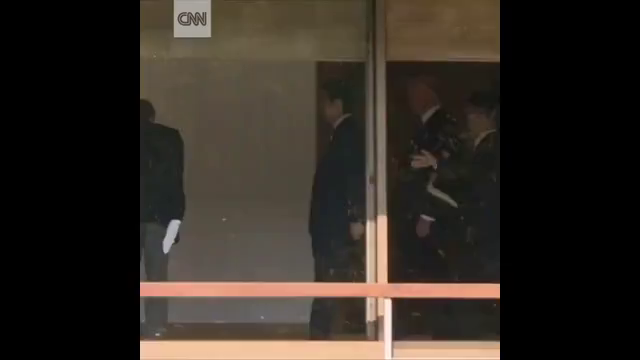 What type of bias is CNN’s edited video an example of? b) How does the unedited clip change your view? 3. 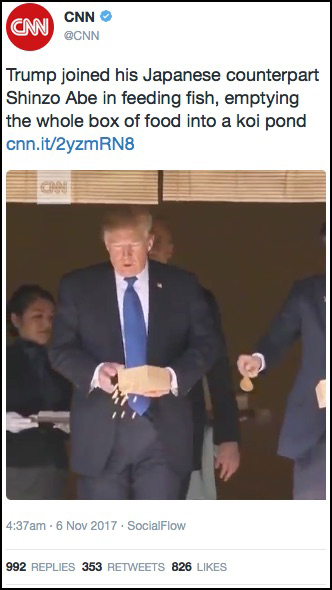 Why do you think CNN chose to give viewers a false impression of the President? 2. a) The edited version gives me the impression that President Trump is a boorish oaf who isn’t aware or doesn’t care about cultural proprieties; that he is a president who embarrasses America. 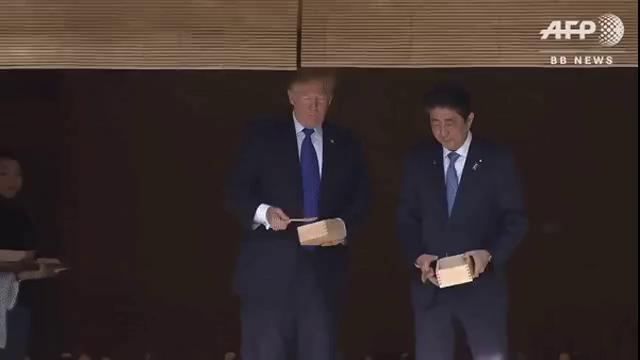 b) The unedited clip shows me that President Trump is actually a gracious person who has good manners and understands how to act in various cultural situations.